I’ve not used Lush in years. It’s not that I don’t like them (I do) or appreciate their brand (I do), I just never really know what to buy from them. Way back when, I used to use their facial soaps religiously and my mum used to buy it for me a couple of times a year. And then I stopped using that and somehow stopped using Lush altogether. On paper, they’re a brand I should be all over. They’re cruelty-free, affordable and committed to doing some good while they’re at it. But somehow, I never found myself shopping there. It could be because there isn’t one in my hometown (or in St Andrews) so I would have to travel for it. It could be because the shop is always super busy when I go in. It could be, quite frankly, because I’m a little bit intimidated by Lush (spoiler: it is). They’re a great brand, constantly raved about and with a plethora of products that I feel I should be trying. If that wasn’t enough to make me feel a little overwhelmed, add to the fact that their shops are usually packed and everything smells amazing and I’ve read great reviews about that and that and that. Next thing I know, I’m walking out of the shop empty handed. While we were in Bath, my mum decided to pop into the Lush shop there to ask about the shampoo bars as my parents are making a real effort to reduce the amount of plastic that they use. It’s an idea that my Dad has brought into our house and one I’m very proud of him for and happy to be a part of. The young woman we were helped by was so brilliant, informative and keen to find the right products for my mum that I thought I would pick her brains too. I asked her to recommend some products for stressed skin and she suggested a range of products that might help me. The nice bit was that there was no pressure to buy but having a curated selection made the whole process a lot less intimidating for me. Ultrabland Facial Cleanser – apparently this is the holy grail of Lush products and I can see why. It’s left my skin feeling so clean! Full of Grace Serum Bar – a solid serum? Weird, right? I thought so too but this has been leaving my skin so soft and supple that I am converted. You simply warm it up in your hands and then work it into your skin. I prefer to do this before bed because it is quite intense but I love it. 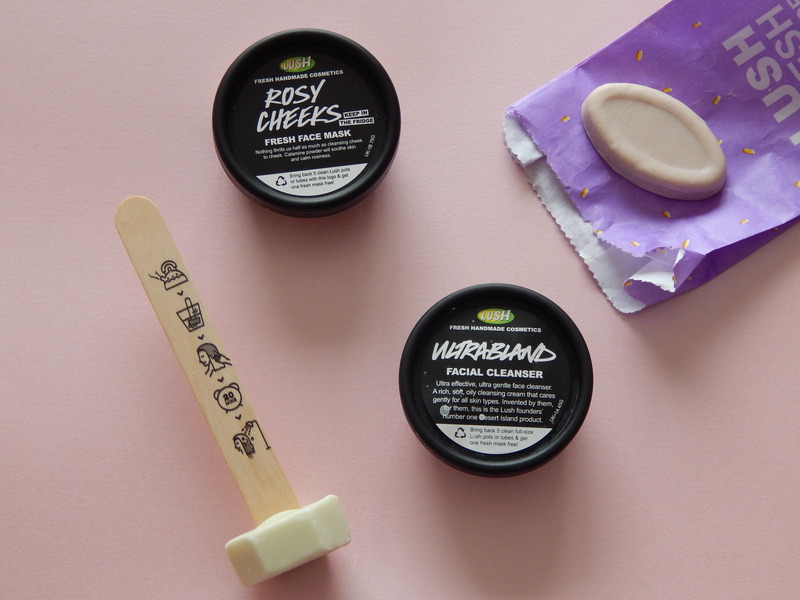 Rosy Cheeks Fresh Face Mask – this is a wonder product and definitely one that I would repurchase when I finish this tub. You keep it in the fridge and it does have quite a short use-by date but it makes a real difference to my skin after just one use. I have been using these products for a week or two now and really like them. While I’m not sure that I’m ready to dive right in to the world of Lush (so. much. choice), I am glad that I’ve reintroduced the brand into my collection. And maybe, just maybe, next time I’m near a Lush store, I’ll pick up another product. Before I go however, I need to talk about one more product that I picked up in Lush but haven’t yet tried: the Damaged Hot Oil Treatment. This promises to fix damaged hair so I’m keen to see if it can help my unruly hair – I’ll report back soon! If there was ONE Lush product that you think I should try, please let me know!